Today I decided to make energy soup for lunch. It's green and vibrant and full of nutrition. The cornerstone of the Living Foods Lifestyle is Energy Soup, a blended mixture of greens, sprouts, vegetables, Rejuvelac, and dulse. 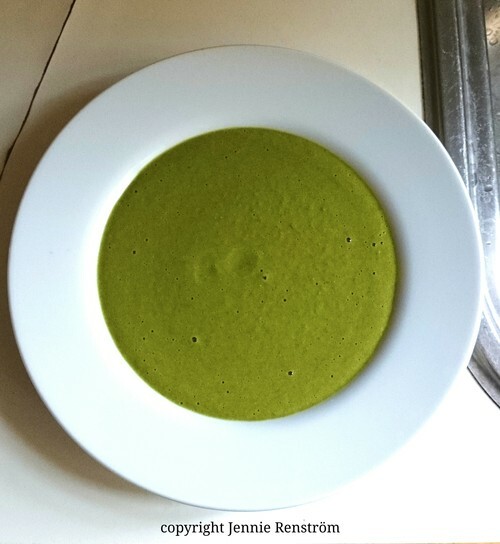 Energy soup is a complete meal, containing every nutrient in a balanced form that the body needs. Dr. Ann Wigmore, the founder of the concept of raw food, advocated juicing fruits and vegetables as a way to obtain optimal nourishment. However, in her later years, she became a proponent of blending foods rather than juicing them. The only juices she used were watermelon and wheatgrass. She believed that juices can be too cleansing for most people's bodies. "Blending helps the body to clean itself and thus it restores health much quicker than just eating the foods as salads, yet it does not overtax the system with the rapid cleansing action of juices," she wrote. "Also, juices do not contain fiber. Separating the fiber and other elements from the juice results in a food that is not as balanced as Nature would have it." Rejuvelac is a Fermented Living Food Drink. You can also use sauerkraut or cabbage as the base and you get the important enzymes that help digest the food. To make the soup more sweet, as an alternative to apple you may also use one banana or some watermelon.